For other uses, see Iron Butterfly (disambiguation). Iron Butterfly is an American rock band best known for the 1968 hit "In-A-Gadda-Da-Vida", providing a dramatic sound that led the way towards the development of hard rock and heavy metal music. Formed in San Diego, California, among band members who used to be "arch enemies", their heyday was the late 1960s, but the band has been reincarnated with various members with varying levels of success, with no new recordings since 1975. The band's seminal 1968 album In-A-Gadda-Da-Vida is among the world's 40 best-selling albums, selling more than 30 million copies. Iron Butterfly is also notable for being the first group to receive an RIAA platinum album award. The band formed in 1966 in San Diego. The original members were Doug Ingle (vocals, organ, formerly of Jeri and the Jeritones and Palace Pages, Iron Butterfly's forerunner), Jack Pinney (drums), Greg Willis (bass) and Danny Weis (guitar, also of Palace Pages). 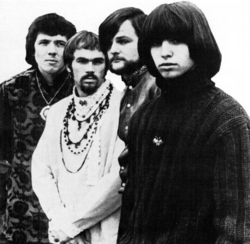 Ingle has said in interviews over the years that he had heard of the Iron Butterfly moniker being used briefly by another band from the San Francisco Bay area and liked its "light and heavy" connotation. They were soon joined by tambourine player and vocalist Darryl DeLoach. DeLoach's parents' garage on Luna Avenue served as the site for their almost nightly rehearsals. Jerry Penrod replaced Willis after the band relocated to Los Angeles in the summer of 1966 when the Willis family refused to allow Greg to move to LA due to his young age. Pinney stayed around a little longer but eventually left as well to return to school. Bruce Morse then became the group's new drummer until Ron Bushy (from a group called the Voxmen) came aboard when Morse left due to a family emergency (Bruce later returned to take Bushy's spot in the Voxmen). A booking at Bido Lito's club on the Sunset Strip soon led to regular appearances at the Galaxy Club and the Whisky a Go Go. In early 1968, the band's debut album, Heavy, was released after signing a deal with Atco, an Atlantic Records subsidiary, the group having been signed by Atlantic's Charles Greene, who was co-producer of Heavy. All but Ingle and Bushy left the band after completing the album in the late summer of 1967. The remaining musicians, faced with the possibility of the record not being released, quickly found replacements in bassist Lee Dorman and 17-year-old guitarist Erik Brann (also known as "Erik Braunn" and "Erik Braun") and resumed touring. Brann had previously played with a band called Paper Fortress. In a 1986 interview with IB's fan club fanzine, The Butterfly Net, Brann stated that Jeff Beck, Neil Young and Michael Monarch (who would go on to join Steppenwolf) had also expressed interest in joining the group to replace Weis, but after he was chosen, Penrod and DeLoach, uncomfortable with Brann's young age and frustrated with the time it was taking for him to learn the Butterfly's set, decided to leave after Weis did. During this time, IB were represented by the William Morris Agency, which booked all their live concerts. DeLoach subsequently recorded with Two Guitars, Piano, Drum and Darryl, while Weis and Penrod went on to form the group Rhinoceros. In 1970 DeLoach formed Flintwhistle along with Jerry Penrod and Erik Brann; the band performed live for about a year before breaking up. The 17-minute "In-A-Gadda-Da-Vida", the title track of Iron Butterfly's second album, became a top-30 hit (edited down to 2:52) in the US in 1968, re-entered the Hot 100 chart in late 1969, and made the number-9 spot on the Dutch Top 40 in 1970. The members when In-A-Gadda-Da-Vida was recorded were Doug Ingle (vocals and organ), Lee Dorman (bass guitar), Ron Bushy (drums) and Erik Brann (guitar and vocals). The album was awarded a gold disc by the RIAA in December 1968  and had sold over three million copies by the end of 1970, going platinum along the way. It stayed on the Billboard charts for over a year and ultimately sold over 30 million copies. Iron Butterfly played its first national tour in the summer of 1968 alongside Jefferson Airplane. The band had been booked to play at Woodstock in August 1969, but got stuck at LaGuardia Airport. When they called the promoters of the concert, they explained the situation and asked for patience. However, their manager sent a telegram demanding that the Butterfly be flown in by helicopter, whereupon they would "immediately" take the stage. After their set, they would be paid and flown back to the airport. According to drummer Bushy, "We went down to the Port Authority three times and waited for the helicopter, but it never showed up". Woodstock Production Coordinator John Morris claims he sent the manager a telegram reading: "For reasons I can't go into / Until you are here / Clarifying your situation / Knowing you are having problems / You will have to find / Other transportation / Unless you plan not to come." The first letter of each line in the telegram spelled out an acrostic making clear that the band was not welcome. Despite missing Woodstock, the group was a regular fixture at other big pop festivals of the late sixties, including Newport Pop Festival, Miami Pop Festival, Denver Pop Festival, Atlantic City Pop Festival and New Orleans Pop Festival. The next album, Ball (January 1969), reached number three on the charts and went gold, but more lineup changes followed, as Erik Brann departed after a final show with the band in San Diego on December 15, 1969, frustrated by the band's unwillingness to move in a harder rock direction. In August 1970, with Brann gone, Iron Butterfly released their fourth studio album, Metamorphosis, with two new members, guitarist/vocalist Mike Pinera (whose Blues Image had opened for the Butterfly's Vida tour) and guitarist Larry "Rhino" Reinhardt (from the Allman Brothers Band forerunner Second Coming). Both Pinera and Rhino, who joined after Brann departed, had already been secretly rehearsing with the Butterfly from September 1969 on after Brann had voiced his objections in continuing. The album managed to get into the top 20. But Doug Ingle, not totally on board with the new guitar-oriented blues and soul direction of the music and wanting to get off the road, announced his intention to leave the group while they were on tour with Yes in Europe in January/February 1971. Without an organist for the first time in their history, the remaining four members (with Bushy eventually being replaced on the record by a session drummer, at the producer's prompting) cut the 45 rpm single, "Silly Sally". Putting forth a horn-based sound more characteristic of groups like Blood Sweat and Tears, the single failed to chart and proved to be their last recording (before their mid-70s reformation). The band, with Ingle in tow, decided to play one final tour, pairing with Black Oak Arkansas. Pinera's band-mate from Blues Image, drummer Manny Bertematti, filled in for Bushy for most the dates on this tour after the latter suffered a shoulder injury. The group then broke up after playing the tour's final show at Central Oregon Community College in Bend, Oregon on May 23, 1971. Another reason for the band not continuing at this time, according to a later interview by Pinera, was the group's being hit for unpaid taxes by the IRS. Dorman and Reinhardt subsequently founded Captain Beyond. In 1974 Brann was contacted by a promoter about reforming Iron Butterfly, so he reunited with Ron Bushy to form a new version of the group, signing with MCA Records and joined by Bushy's friend, bassist Philip Taylor Kramer, and keyboardist Howard Reitzes, a friend of Brann's who worked in a music store. Brann, who had done occasional lead vocals during Iron Butterfly's original run, served as the band's main lead vocalist this time. The album Scorching Beauty was released in January 1975 with Reitzes and Sun and Steel in October 1975 with Bill DeMartines replacing Reitzes. Both albums were criticized for bearing little resemblance to the original tone of the group and sold poorly compared to their earlier releases. In 1977, the Bushy/Brann/Kramer/DeMartines grouping wound down after being plagued with bad management and tour dates that had started off in theaters but ended up in bars and clubs. Bushy, Kramer and DeMartines formed Magic and Lee Dorman put together a new IB lineup with Rhino that contained British singer Jimi Henderson, Larry Kiernan on keyboards, David Love on guitar and Kevin Karamitros on drums. This grouping toured mostly in the South. By 1978 the lineup was Dorman, Karamitros, Pinera and John Leimseider on keyboards. In the late fall of 1978, a German promoter made an offer for the band to tour. The Metamorphosis lineup (Ingle, Bushy, Dorman, Pinera and Rhino) made preparations, but just before they were to depart for Germany, Dorman's father took ill and another bassist, Keith Ellis (formerly of Boxer), was brought in to cover for Dorman in case he had to suddenly return to the US. During the tour, Ellis died in Darmstadt, Germany on December 12, 1978. After their return to the US, the Metamorphosis group played a few homecoming shows in early 1979, joined by Erik Brann for guest appearances. Later in 1979, Bushy returned to his other group, Gold, and the next IB lineup was: Mike Pinera, Lee Dorman, Doug Ingle, a returning John Leimseider and Dorman's Captain Beyond band-mate, drummer Bobby Caldwell. Still later that same year, Bobby Hasbrook, from Hawaii, joined the band as lead guitarist and lead vocals alongside Dorman, Pinera, Caldwell and Leimseider. IB's lineup was in a contant state flux from late 1979 on as exhibited in the following groupings: Brann, Dorman, Leimseider, Caldwell and Hasbrook (1979); Pinera, Brann, Dorman, Hasbrook, Caldwell and Nathan Pino – keyboards (1979); Dorman, Brann, Hasbrook, Tim Kislan – keyboards, Zam Johnson – drums and Starz Vanderlocket – vocals, percussion (1980); Dorman, Rhino, Leimseider, Randy Skirvin – guitar, Jimmy Rock – drums and Luke – vocals, percussion (1981–1982); Pinera, Dorman, Rhino, Guy Babylon – keyboards and Jan Uvena – drums (1982) plus Pinera, Dorman, Rhino, Babylon and Bushy (1982). On July 31 1982, the Pinera, Dorman, Rhino, Babylon and Bushy lineup went into Music Sound Connection Studio in Studio City, California to record some material, none of which has ever been released. At the tail end of 1982, Ingle returned to the fold once more as John Shearer (from Steve Hackett's band) came in on drums and percussionist Luke also rejoined since Bushy had taken a sales job outside of music for Makita Tools. Brann (who had guested at some shows during 1982) soon ended his association with the band at this time as well. Pinera left again, as did Luke, in 1983 and IB worked on some more material in September of that year, with drummer Jerry Sommers playing on some tracks. But once again, nothing ever came of it. Then Ingle, Dorman, Rhino and drummer Rick Rotante undertook the "Wings of Flight Tour" in early 1984, with Lenny Campanero (ex-Badfinger) replacing Rotante for more recording sessions at Salty Dog Studios in Van Nuys, California. The "Legends Tour" took place in the fall of 1984 with Ingle, Dorman, Campanero and guitarist Steve Fister (later of Steppenwolf) and another Steppenwolf alumni, bassist Kurtis Teal, took Dorman's spot for the "Phoenix Tour" in the fall of '85, which ended in late November, shortly after which, Teel suddenly died of a heart murmur on December 2. The group then disbanded once again due to managerial problems. In the spring of 1987, Bushy and Pinera got back together to tour as Iron Butterfly for the "Wings of Flight 87" tour (Dorman was captaining a fishing boat, so was not available at this time) with Ace Baker (keyboards) and Kelly Reubens (bass). Tim Von Hoffman and Glen Rappold (guitar, bass) soon replaced Ace Baker and drummer Donny Vosburgh (who'd been in Thee Image with Pinera) guested at some of these 1987 shows and subbed for Bushy on others. But this was short-lived, as Bushy and then Brann both rehearsed different IB lineups in August and September of that year (see Lineups below) that never made it to the concert stage. In December 1987 the "classic lineup" of Ingle, Brann, Dorman and Bushy got together at The Roxy Theatre in West Hollywood, CA to prepare for a thirty date tour of the East Coast in the winter and spring of 1988 that culminated on May 14, 1988 with an appearance at Atlantic Records 40th Anniversary celebration at Madison Square Garden alongside Led Zeppelin and many others. After this, Brann and Dorman decided to continue on, bringing in Rhino, keyboardist Derek Hilland and drummer Sal Rodriguez (replaced by Kenny Suarez). They were joined by singer/frontman Steve "Mick" Feldman and backup singers JoAnne Kurman-Montana and Cecelia Noel also appeared with the band for a few shows in 1989, as well as another drummer, Doug Freedman, who subbed for Suarez in the fall of '89. The 1989 IB lineup of Brann, Dorman, Rhino, Hilland, Feldman and Suarez appeared at Woodstock '89, which took place in August 1989 twenty years to the day of and on the site of the original Woodstock concert of 1969 as a spontaneous celebration of the event's 20th anniversary. In 1990, after Brann fell out with the others and left Iron Butterfly for good, Dorman, Rhino, Hilland and Suarez recorded an album with singer Robert Tepper that was meant to be an IB album called We Will Rise but instead was shelved and eventually reworked into Tepper's 1996 solo album, No Rest For The Wounded Heart. After the Tepper-led lineup failed to break through, Tepper left to continue his solo career and Dorman, Rhino and Bushy went back on the road in early 1993 with keyboardist Burt Diaz. But after Rhino and Diaz decided to leave, Pinera was brought back, along with keyboardist Hilland. Pinera, by this time, had formed his own group, the Classic Rock All-Stars, so was not available for all of the Butterfly's shows. Guitarist Denny Artache (summer 1993), then Doug Bossey (1994), filled in until Pinera was dropped in 1994, with Bossey, then Eric Barnett (in 1995), taking over. Doug Ingle rejoined the band, yet again, on vocals and keyboards from July 1994 to early 1999. In the spring of 1997 the band did a tour of Europe with "classic era" members Ingle, Bushy and Dorman, along with Hilland and Barnett. A DVD of live performances from the tour was released in 2008. Hilland was dropped in 1997 and Ingle officially retired from performing in early 1999. Singer/keysman Damian Bujanda had a brief tenure, but after leaving for personal reasons, Larry Rust joined the band as vocalist/keyboardist from 1999–2005. In 2001, after Dorman took ill, one of the band's road crew, Oly Larios, sat in on bass. Guitarist/vocalist Charlie Marinkovich joined the band in 2002. Originally from Seattle, Marinkovich had played with Randy Hansen and others. Original vocalist Darryl DeLoach (born on September 12, 1947) died of liver cancer on October 3, 2002 at the age of 55. On July 25, 2003, Erik Brann died of heart failure at the age of 52. Derek Hilland returned to play keyboards for the group's 2003 dates when Larry Rust was not available. German violinist, keyboardist, and composer Martin Gerschwitz, who had formerly worked with Lita Ford, Meat Loaf, Walter Trout, and most recently Eric Burdon and The Animals, joined the band in 2005, replacing Larry Rust. In early 2006, Rust came back briefly to substitute for Gerschwitz for dates in Italy, Croatia and Austria. Later that very same year, Ken Chalupnik and Dave Meros filled in for Dorman. In early 2010, an announcement was made that Iron Butterfly would receive the Lifetime Achievement Award at the 20th Annual San Diego Music Awards, which took place on September 12, 2010. The award was presented by San Diego Mayor Jerry Sanders. Later the same year, Ray Weston (formerly of Wishbone Ash) came in to substitute on drums for Ron Bushy after he was sidelined by health issues. In early 2012, Phil Parlapiano substituted for Martin Gerschwitz for a few shows when Gerschwitz was unable to play due to his own solo-tour schedule. Former guitarist Larry "Rhino" Reinhardt died on January 2, 2012, at the age of 63, due to cirrhosis of the liver. Bassist Lee Dorman, who had a history of heart trouble, died on December 21, 2012 at the age of 70. Both Reinhardt and Dorman were also founding members of Captain Beyond, along with former Deep Purple vocalist Rod Evans and drummer Bobby Caldwell. Following Dorman's death, Iron Butterfly dissolved once more. Charlie Marinkovich revealed in 2013 that he had departed the band altogether and that Ron Bushy was very ill, shrouding the band's future in doubt. At times during his recovery in 2014, Ron Bushy entertained the idea of putting a new Iron Butterfly band together, possibly with Martin Gerschwitz returning on keyboards and lead vocals. In late 2014, reports surfaced of the band reforming, with a lineup consisting of Bushy, Mike Pinera, Doug Ingle, Jr. on keyboards and an unnamed bassist. However, this reformation did not come to fruition and in 2015 the band unveiled a lineup consisting of Bushy and returning guitarist Eric Barnett, along with new members Mike Green (percussion), Dave Meros (bass), Phil Parlapiano (keyboards) and Ray Weston (drums). Meros, Parlapiano and Weston have all previously played with Iron Butterfly as substitute musicians; Meros for Dorman (in 2006) and Weston for Bushy (in 2010), respectively. At present, Ron Bushy remains a member of Iron Butterfly, but is not performing due to his health concerns, leaving Weston as sole drummer for the band at current appearances. Founding IB bassist Greg Willis, who suffered a stroke in April 2012, passed away on November 11, 2016 at age 67 in Portland, Oregon. A tribute concert was staged November 30 at a club called Nicky Rottens in El Cajon, California. Former Butterfly keyboardist Larry Rust died peacefully at his home near Los Angeles on November 25, 2016 at the age of 63. On January 8, 2018 it was revealed by the band on their official Facebook page that Martin Gerschwitz had returned to the band in place of Phil Parlapiano. 1967 "Don't Look Down on Me"
"In the Time of Our Lives"
"I Can't Help But Deceive You Little Girl"
1970 "Easy Rider (Let the Wind Pay the Way)"
"High on a Mountain Top"
Buckley, Peter (2003). The Rough Guide to Rock. London: Rough Guides. ISBN 1-84353-105-4. ^ Talevski, Nick (2006). Rock Obituaries – Knocking On Heaven's Door. Omnibus Press. p. 127. ISBN 978-1846090912. ^ A. Hamilton, Neil (1997). The ABC-Clio Companion to the 1960s Counterculture in America. ABC-CLIO. p. 3. ISBN 978-0874368581. ^ "Lifetime Award; The San Diego City Beat". September 7, 2010. Archived from the original on January 1, 2014. Retrieved 2011-05-31. ^ "DRUMHEAD Magazine". Drumheadmag.com. Retrieved 2014-04-18. ^ Joynson, Vernon (1995). Fuzz, Acid, & Flowers Archived 2011-08-25 at the Wayback Machine. London: Borderline Books. ^ "Iron Butterfly". San Diego Reader. Retrieved 2014-04-18. ^ Murrells, Joseph (1978). The Book of Golden Discs (2nd ed.). London: Barrie and Jenkins Ltd. p. 242. ISBN 0-214-20512-6. ^ "Gold & Platinum". Riaa.com. Retrieved 27 October 2017. ^ Mover, Johnathan. Iron Butterfly's Ron Bushy Making History drumheadmag.com. Retrieved on 2009-08-31. ^ Fornatale, Pete. "Back to the Garden: The Story of Woodstock, "Sweetwater"". Google Books. Retrieved August 17, 2017. ^ Brock., Helander, (2001). The Rockin' 60s. London: Music Sales. ISBN 9780857128119. OCLC 993090335. ^ Daniel., Bukszpan, (2003). The encyclopedia of heavy metal. New York: Barnes & Noble Books. ISBN 0760742189. OCLC 51804645. ^ "Official Website". Chasmo.com. Retrieved 7 October 2011. ^ "The Chronology: 2000 – 2004". Angelfire.com. 2005-10-24. Retrieved 2014-04-18. ^ "» Darryl DeLoach The Music's Over". Themusicsover.com. Retrieved 27 October 2017. ^ Perrone, Pierre. Erik Brann Obituary in The Independent UK Newspaper Independent.co.uk. 2003-08-07. Retrieved on 2010-07-12. ^ "About". Martingerschwitz.com. Retrieved 2011-07-07. ^ "San Diego Music Awards". San Diego Music Awards. 2013-07-16. Retrieved 2014-04-18. ^ Varga, George.Rock 'n' Roll Mayor loves Iron Butterfly San Diego Union Tribune Weekly Insert, Night & Day. 2010-09-03. Retrieved on 2010-09-04. ^ MeddleEarth. "Iron Butterfly 2012-05-13 Portland Oregon – sample: Easy Rider". YouTube. Retrieved 2012-11-10. ^ "The Official Iron Butterfly Website". Ironbutterfly.com. Retrieved 2014-04-18. ^ "Iron Butterfly Reforming With Ron Bushy, Mike Pinera and Doug Ingle, Jr. ~ VVN Music". Vintagevinylnews.com. 2014-12-13. Retrieved 2015-08-19. ^ "Ironbutterfly.Com". Ironbutterfly.Com. Retrieved 2015-08-19. ^ a b "Iron Butterfly Chart History". Billboard. Prometheus Global Media. Retrieved April 20, 2018. ^ a b "Gold & Platinum – RIAA". RIAA. Retrieved 2018-11-29. ^ "Iron Butterfly Chart History". Billboard. Prometheus Global Media. Retrieved April 20, 2018.